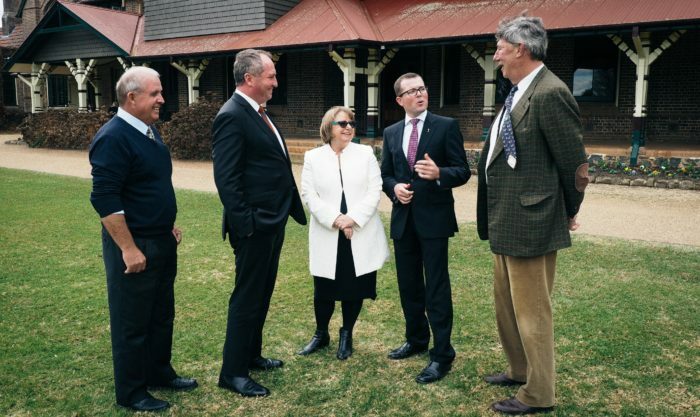 NSW Senator John Williams, left, UNE Vice Chancellor Annabelle Duncan, Deputy prime Minister and member for New England Barnaby Joyce, Northern Tablelands MP Adam Marshall and UNE Chancellor James Harris discuss news of the APVMA’s move to Armidale. THE Federal Government commitment to relocating the Australian Pesticides and Veterinary Medicines Authority (AVPMA) to Armidale is another important boost for a city coming out of a long sleep, local State MP Adam Marshall said. “This announcement is a massive vote of confidence, not just in UNE and Armidale, but in our entire region,” Mr Marshall said. Barnaby Joyce, the Federal Member for New England, today announced that a re-elected Coalition government will proceed with the co-location of the AVPMA to establish a Centre of Agricultural Excellence at the University of New England (UNE). “Moving this agency to Armidale will swell the city by 175 employees and their families, and do a huge amount of economic good for local businesses, schools and clubs. There will be extra flights, and extra trade in goods and services,” Mr Marshall said. “It really fits in neatly for this city’s economic development plan. It’s about creating more jobs and growth, and helping this city realise the vast potential that has been untapped for some time now. Almost exactly a year ago, Mr Marshall led a delegation of representatives from Armidale and UNE to Canberra to brief the agency on “Living and working in a regional city”. Six AVPMA representatives subsequently made a reciprocal visit to the region to assess it first-hand. UNE Chancellor James Harris said the AVPMA move would add to the university’s already considerable critical mass in agricultural education, research and knowledge. “The move would give UNE and the agricultural and chemical industries a chance to do things more efficiently,” Dr Harris said.